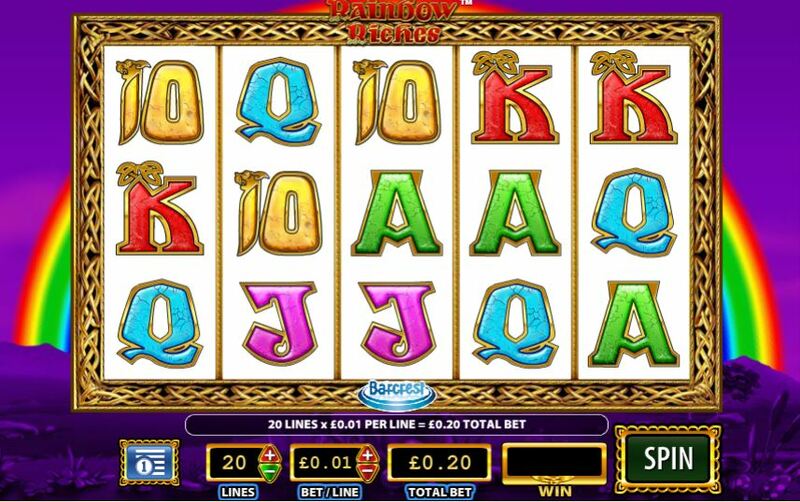 It is rainbow galore with this fantastic five reel, three line online slot game from the team at Barcrest Games. With its very traditional layout and many features to grab your attention, you can play for free or for real money if you want. The Irish theme has attracted a lot of popularity from UK gamers, not to mention the cute leprechauns who are one of the bonus symbols in the game. They can trigger a massive jackpot if you manage to match them on the reels. Barcrest Games were founded way back in 1968 in the greet and powerful Greater Manchester area. At first, they focused mainly on land-based slot machines within the United Kingdom. Go to any pub, bingo hall or restaurants around the UK and you will be sure to find one of Barcrest’s machines. After being acquired by IGT then by Scientific Games, Barcrest now focuses on creating online and land-based games. Being a part of a much wider gaming business means they have strong links with other developers and can bring you the very best entertainment. Many of their games are available across the platforms so you can pick and choose how you play. Barcrest has a plethora of games to their names and remains one of the longest-running developers of slot games around. Their most nitrous machine games included the traditional fruit machines we all know and love. One of their most loved and well-known series is Rainbow Riches, it has many variations both online and on land so why not venture down to the local pub and see if they have Barcrest famous machines? * Jewel in the Crown. * Dr Jekyll Goes Wild. * Himalayans Roof the World. * Legend of the Pharaohs. Play today, other games by Barcrest Games! Rainbow Riches is a game that new and experienced gamers can enjoy. There are plenty of bonus features to be triggered and gain you a bigger jackpot. Not to mention the fact you can play for as little as 20p or for free if you want to, a brilliant additional for those new gamers who may not be confident to raise the stakes just yet. There are five reels and three lines, the usual symbols include brightly coloured letters and the Wild takes the form of gold leprechauns. If you manage to match five of the Wilds across the reels, you could win the jackpot of 500 coins. The traditional format echoes game gone by and it is very easy to match the various symbols on the screen, as well as the other great bonus symbols, are thrown into the mix. And all the hard work is taken care of, the game will tell you how much and where you have won. The soundtrack accompanying the game is enough to get anyone bopping along, so hit that spin button and see what happened. Luck might be on your side. * Road to Riches Bonus: this is a bonus feature triggered by getting 3 or more Bonus Leprechaun symbols on the reels. Then a wheel will spin and stop on a number, this will be how many steps you are allowed to take in order to get to the jackpot. Once you reach it or land the collect sign on the wheel, you can get the amount which will be multiplied, this can be up to 500x your original bet. * Pots of Gold Bonus: this can be triggered by getting the Pots of Gold symbol on reel 2, 3 and 4 only. Gold, silver and bronze pots will spin around and the arrow will land on one pot. You could win up to 500x your original bet which is a very nice sum indeed. The pots are very typical and in keeping with the Irish theme. Hopefully, there won’t be any leprechauns guarding them! * Wishing Well Bonus: this can be triggered by getting 3 or more Wishing Well symbols on the reels. You will get the chance to choose 1 of 3 prizes from the wishing wells. And you could win up to 500x your total bet. Are you brave enough to trust the well? You could be well rewarded if you manage to trigger this bonus.